Agile Boston is a lively user community focused on advancing the spread of Agile knowledge and applied practices in the Greater Boston area. Agile Boston's Mission is to encourage and help the Greater Boston Agile community to become the most active, most innovative and most vibrant Agile learning community on the planet, by any measure that can be named. Agile Boston's Vision is simple: A regional community of practice, in the Boston area, that is a thriving ecosystem of Agile learning, continuous improvement and innovation, in service to building energized organizations that create great results. Our Core Values explain, inform and guide everything we do, and are built on the core ideas of RESPECT FOR PEOPLE and CONTINUOUS IMPROVEMENT. Agile Boston started life early in the Fall of 2008. Our first few monthly meetings were attended by up to 140 attendees. We continued to convene and execute well-attended monthly meetings every 4th Wednesday, for about one year. In 2009, Agile Boston started developing larger, 1-day, conference events, like GIVE THANKS FOR SCRUM. This event has become a cultural tradition for Boston. 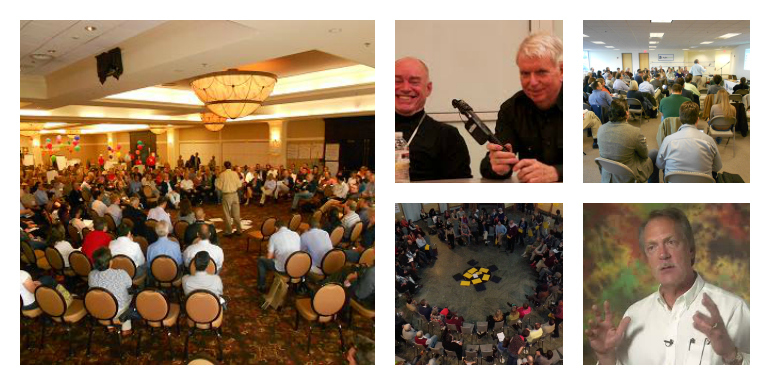 Each year, we honor Jeff Sutherland and Ken Schwaber, the co-formulators of Scrum. We literally “give thanks for Scrum” the week of Thanksgiving each year. In 2009, we had 230 people show up for GIVE THANKS FOR SCRUM. That was a little over the top. We now limit attendance to 165 people, so we have some space to move around. You can learn more here. Agile Boston also pioneered the use of Open Space in Boston, delivering Open Space events as early as Spring 2009. We developed the Agile Boston Open event format, a hybrid format featuring a traditional conference format in the AM and an Open Space in the afternoon. In the Spring of 2010, we had 240++ people attend the Agile Boston Open event at the Microsoft location in Waltham. In the Fall of 2010, we had 240++ people attend the Agile Boston Open event at the Westin Hotel. In the Fall of 2011, Agile Boston convened a similar event, Agile Day in Boston. For that event, we created full proceedings in PDF format. We set up to receive handwritten reports from conveners, scanned them, and shipped them off to a transcriber. Now members of Agile Boston teach other Agile groups throughout the world exactly how to do this. If you want to know how, contact us and we will help you. Today the Agile Boston community meet on the 4th Wednesday of every month in Burlington MA. Throughout the year we facilitate special larger events including: GIVE THANKS FOR SCRUM and the AGILE CULTURE CONFERENCE.